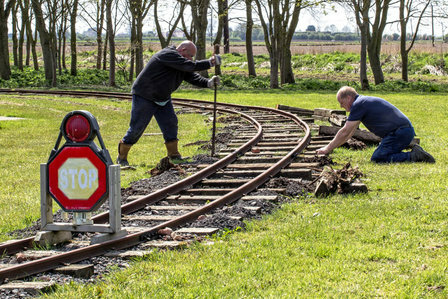 We would like to run our trains more often but we need more volunteers to help our small friendly team with Track Maintenance, Loco & Carriage Maintenance, Guards, Station & Booking Staff, Drivers & Firemen. Get in touch via the contact tab on this page. We work most Wednesdays and some Saturdays all year round - come and meet us! 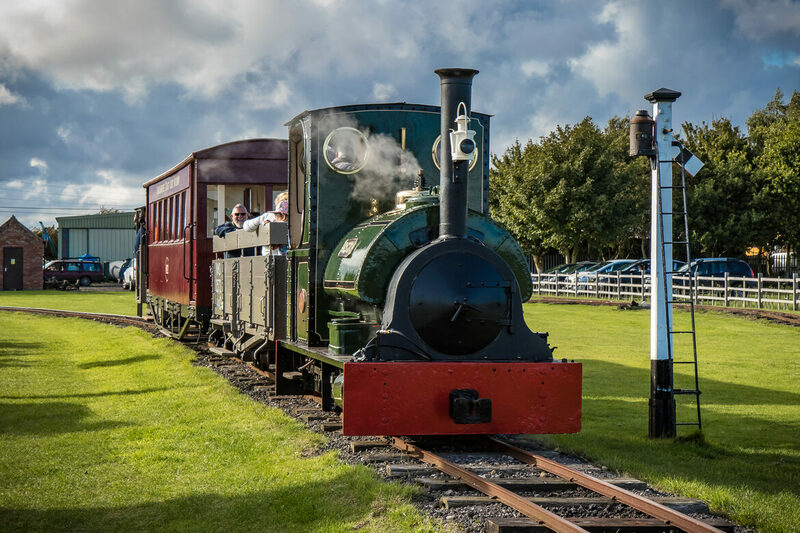 The Lincolnshire Coast Light Railway (LCLR) is a 60 cm narrow gauge heritage railway, approximately 0.75 miles long, situated in Ingoldmells at the award winning Skegness Water Leisure Park on the beautiful Lincolnshire Coast. On our summer operating days you can ride in one of our historic railway carriages, pulled by one of our historic diesel locomotives, or on certain days by our Peckett steam locomotive "Jurassic". The diesel locos are based on designs for WW1 trench railways, which later powered transport for agriculture and industry throughout Lincolnshire and the wider world. 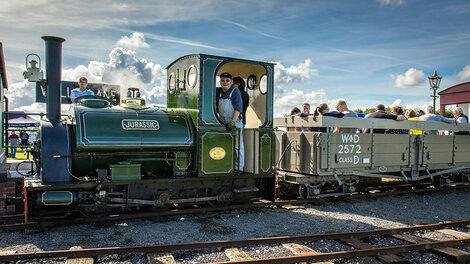 Our steam locomotive "Jurassic" was built in 1903 and spent her working life at a cement works in Southam, near Rugby. Following restoration at the LCLR she returned to steam in mid 2017. Our collection of historic WW1 trench railway vehicles are demonstrated on gala days, and can normally be viewed on operating days. More details of the collection on the LCLR Historic Vehicles Trust page. LCLRHVT nominated for HRA award! 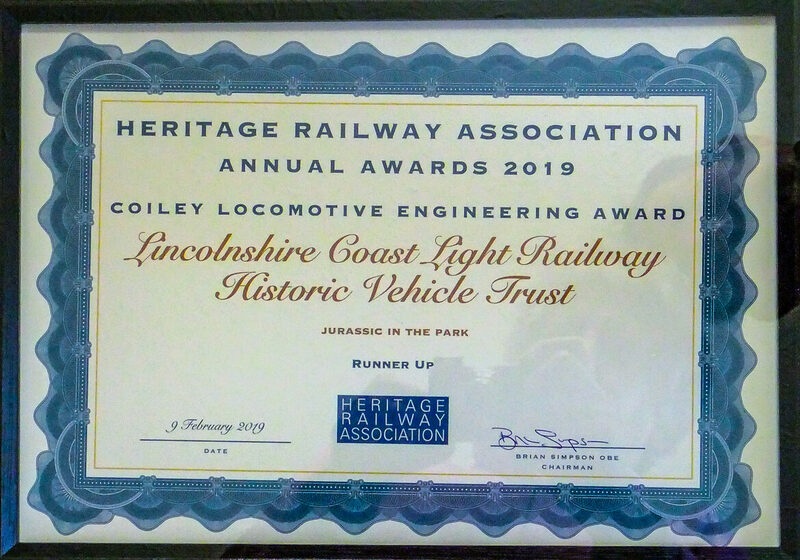 The LCLR Historic vehicles Trust was nominated for the award, a great recognition from the UK wide railway preservation movement, of the efforts made by Trust members and all volunteers to get Jurassic running in the Park again. We were runners up on the night - well done to all involved! 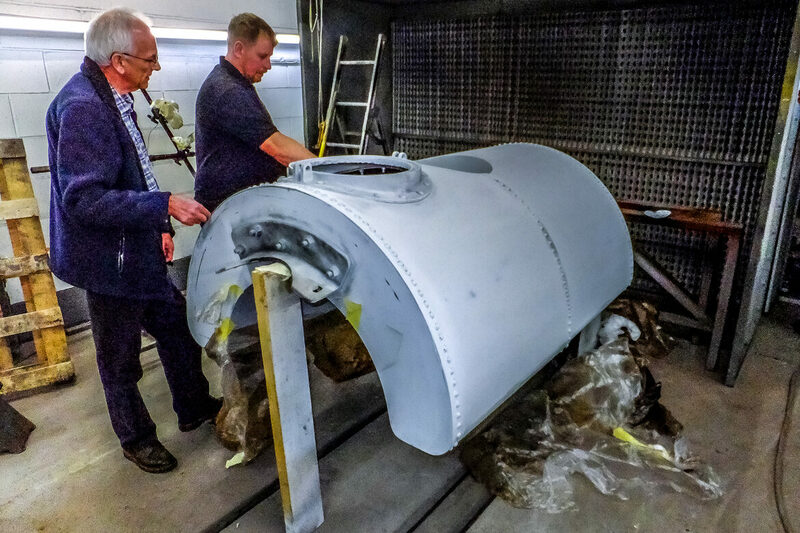 New Saddle Tank for "Jurassic"
The brand new saddle tank for the Trust’s steam locomotive “Jurassic”, which has been fabricated at Statfold Engineering.​The new tank has been riveted as per the original tank which dated from 1903. The tank is expected back at Skegness in mid March. LCLR stock goes on loan to "Tracks to the Trenches 2018"
LCLR at "Tracks to Trenches"
Our steam locomotive "Jurassic" was launched on scheduled passenger duties at the annual Skegness Water Leisure Park "Classic Wheels" car show. A record number of passengers were carried on the day. "Jurassic" will be in regular use for our 2018 season - check website for dates. Celebrating 10 years of running at Skegness this year! Trains will run from 11.00 until 15.45 on these days. Fares are only £1 with children under 3 yrs free. Saturday 15th June - SWLP Caravan Show. Our diesel hauled passenger train will be running - All rides are FREE today! Sunday 15th September - The very popular SWLP "Classic Wheels" Car Show plus WW1 railway stock on view and Steam * passenger trains running. The LCLR will endeavour to run a train service, with the advertised motive power, on these dates so far as circumstances permit. Wherever possible any foreseeable change to our operating days/ motive power will be published on this webpage. 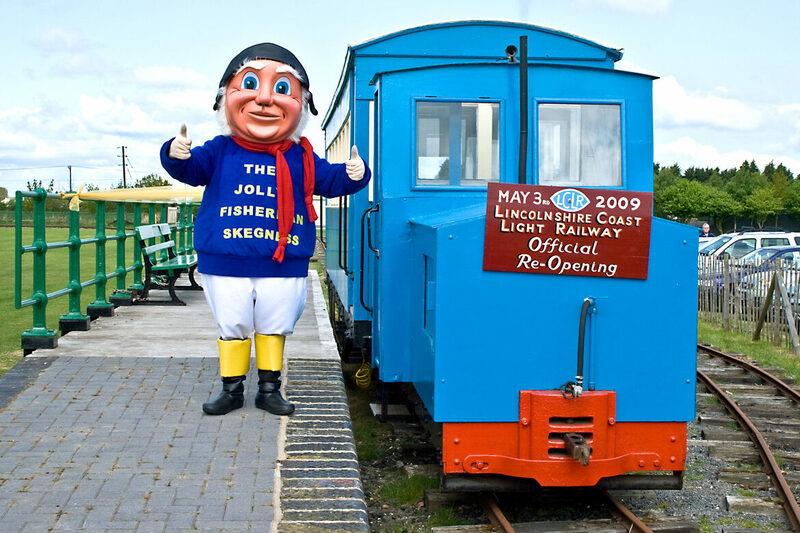 2019 is the 10th anniversary of the LCLR opening at Skegness! Visiting the LCLR - by car. 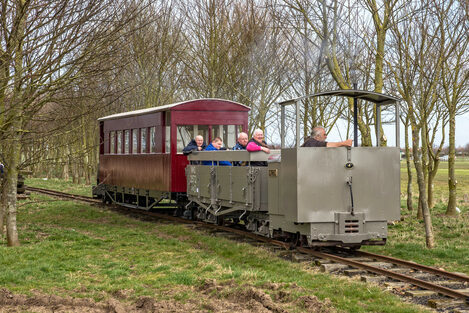 The railway is located on the Skegness Water Leisure Park, PE25 1JF. Look for the brown sign close to Butlins and turn into Walls Lane from the A52 Skegness-Mablethorpe road. Upon arrival please pull in to the "visitors" layby, before the barrier, and enter the reception building. 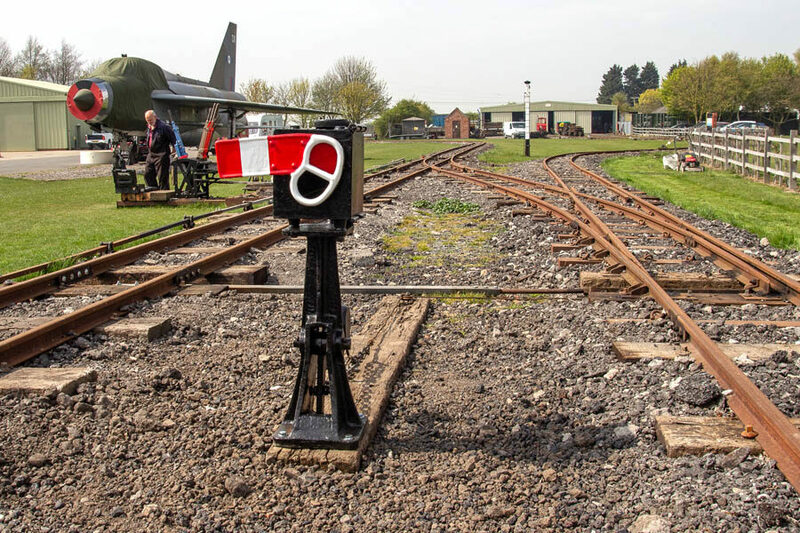 One of the members of the Leisure Park staff will direct you to the railway, and allow your vehicle through the barrier. Please keep the access code given to you, it is also needed for the Park exit barrier.There is no charge for entering the Park and you may use facilities such as The Barn Inn, Coffee Shop etc. 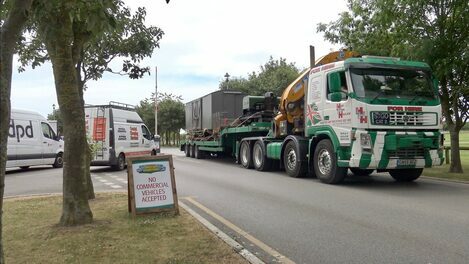 or (by prior arrangement) stay on site Tel. 01754 899400. There is a frequent bus service from Skegness Interchange (and Mablethorpe) - ask for Walls Lane, which is just before Butlins Resort. The Parks pedestrian entrance & LCLR are a short walk along Walls Lane - follow signs. Buses connect at Skegness Interchange with East Midlands Trains from Nottingham, Grantham (for London Kings Cross), Sleaford (for Lincoln and the North) and Boston. Buy an enamel loco badge - Help to maintain our Steam Locomotive! Buy an enamel badge of our steam loco "Jurassic". Click Link for redirection to our eBay sales page. Badges, postcards and DVDs are also available from the guard on the train. The newly extended run round at Walls Lane is complete and now has a new ground frame and blade indicator installed. Sark and the works train seen on crossover. More Information - LCLR Historic Vehicles Trust - Why Not Join Us And Help Run Our Railway? 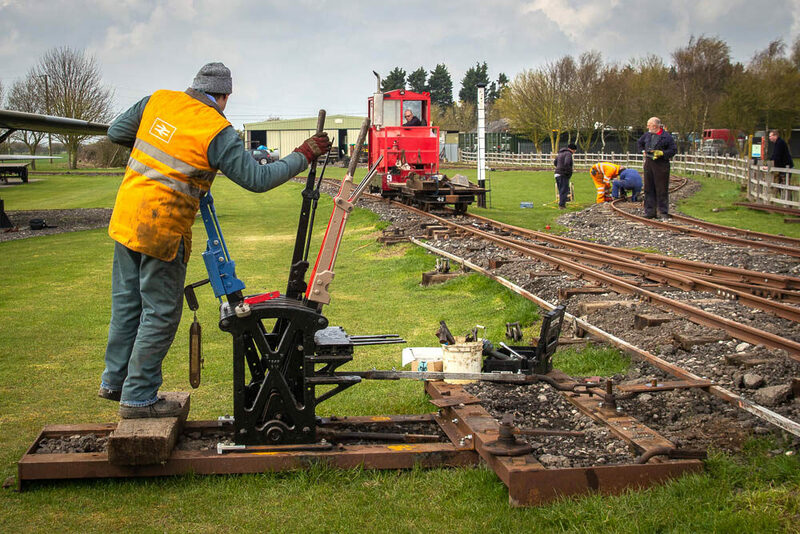 To find out more about the LCLR and its Historic Vehicles Trust (the LCLRHVT), whose members are involved in the restoration and maintenance of the rolling stock, and the operation of the railway, follow the link to the LCLRHVT pages. 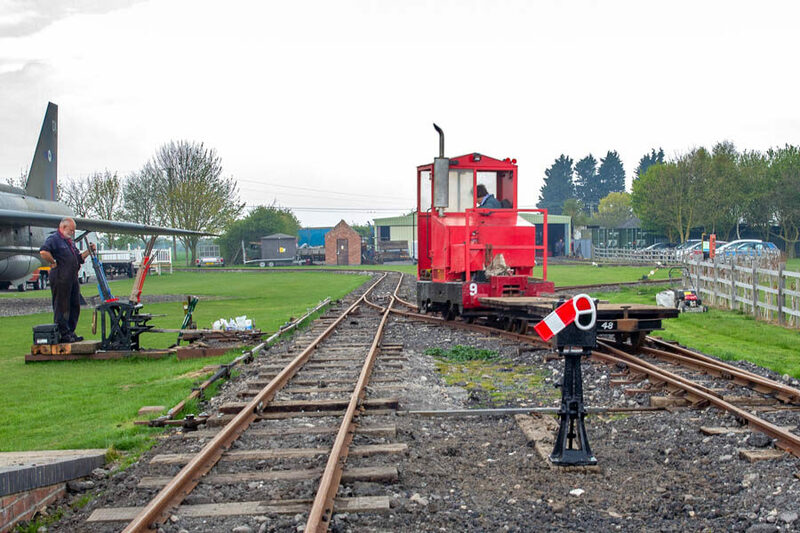 If you`d like to help us run or maintain our railway and its rolling stock use the "contact" tab on webpage header. We`d very much like to meet you! Two of our volunteers work on the track at Airfield Curve on 4th May 2016. Re-sleepering in progress before the running season.